According to the preliminary analysis just released by the Congressional Budget Office and the Joint Committee on Taxation, the Senate Finance Committee’s health bill will cost American taxpayers $829 billion over ten years. 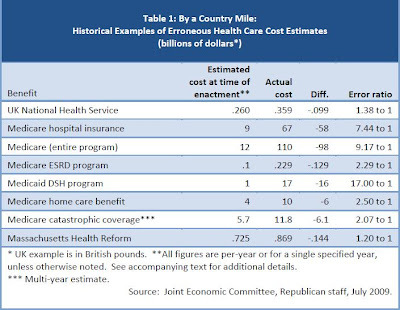 Since the end of World War II, major healthcare reform proposals have generally always cost more—sometimes significantly more—than the highest cost estimates published while the legislation was pending (see table and chart above). Read my full post at The Enterprise Blog. The CBO doesn't even take into account the added burden placed on states by expanding Medicare: "14 million more would enroll in Medicaid, the state-federal program for lower-income people"
"23 million people would buy policies through new insurance exchanges, or marketplaces"
So let's see, 14 million plus 23 million, 37 million... that's more than the 30 million that President Obama said were currently uninsured, right? Well, not according to D.C. math! "94 percent of eligible Americans could be expected to obtain coverage under the plan, up from the current 83 percent." Spending all that dough, and still not everybody covered! Just like now. "About 25 million nonelderly people, about a third of them illegal immigrants, probably would remain uninsured by 2019, the CBO estimated." Love your blog by the way! Go Blue. Funny how when the CBO estimate came in high for other versions of the bill, people said the CBO was unbiased and correct. Now that it comes in lower, they lost their cred. Funny isn't it. The CBO also doesn't take into account that people's behavior changes when taxes are imposed or benefits offered. So it will absolutely be a much worse picture financially. Fundamentally, they still have not answered the question of how we're "saving" money by spending more money. 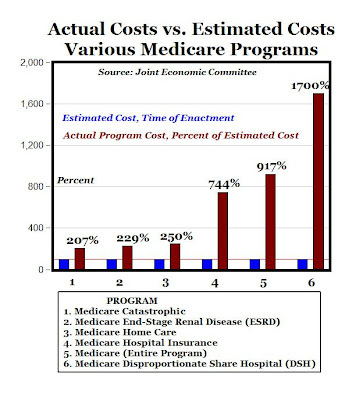 How exactly is Medicare being "saved" by stealing $500 billion from it over the next 10 years (and without rationing)? Anon 8:30 - "Funny isn't it." The CBO came in high on the House bill, HR 3200, which was sponsored by Dingell, Rangel, and Waxman. The current CBO estimate is for the Senate bill offered by Max Baucus, which has a much more severe tax component. I don't find either of them funny, not funny at all.